DESCRIPTION: For many years I have always used thin wood cutouts as tombstones in my annual Halloween display and while they got the job done they lacked dimension. 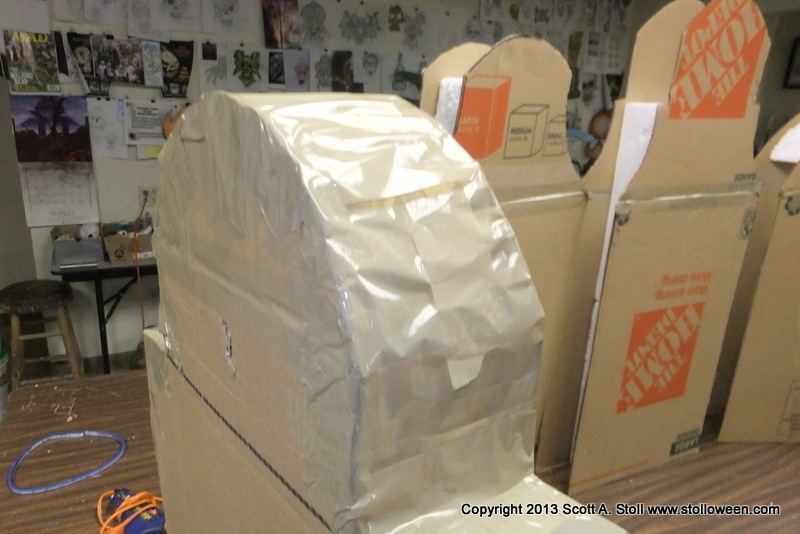 The wood cutouts looked fine when viewed from the front but the illusion was lost when viewed from the side or the back. 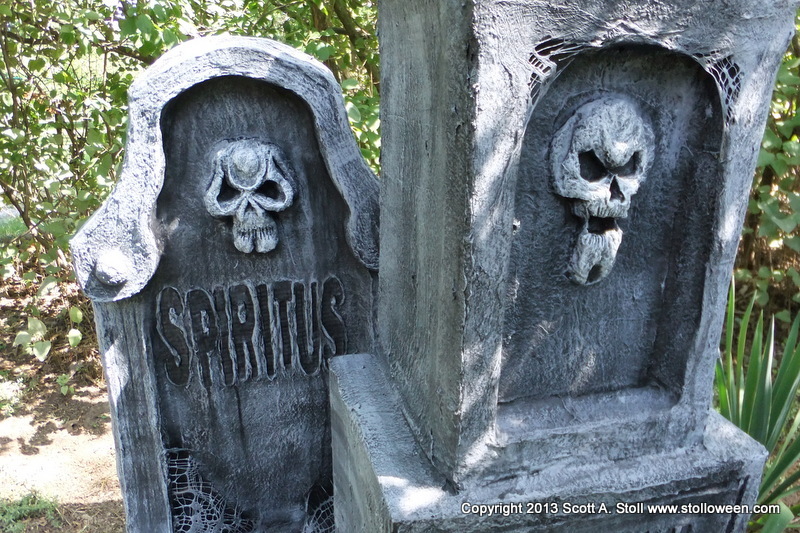 Most real tombstones are thick and chunky and for 2013 I decided it was time to add some depth to my collection of tombstones. 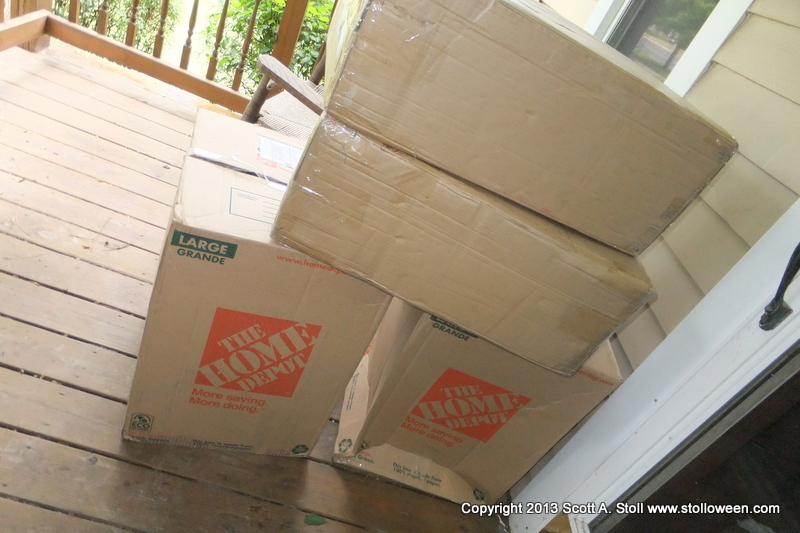 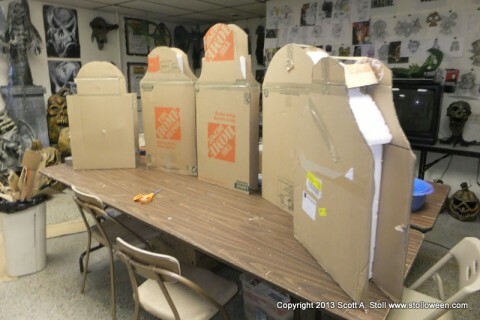 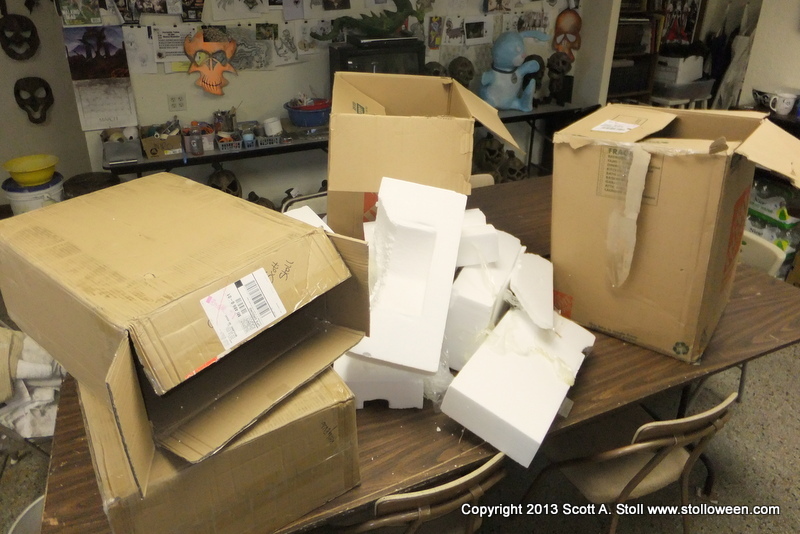 In July I was invited to participate in Home Depot’s Halloween Style Challenge and after receiving an assortment of their Halloween merchandise in the mail I decided to use the cardboard boxes and foam packaging materials to make some chunky tombstones. 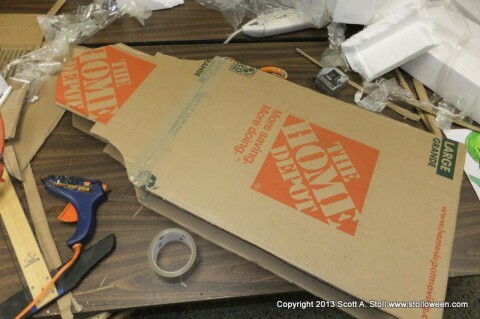 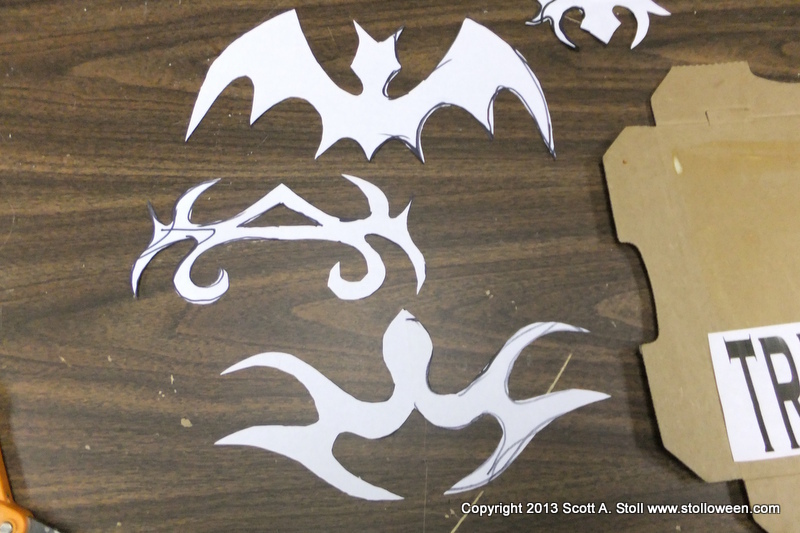 STEP ONE: Recycling the cardboard boxes I first determined the basic shape for the tombstones and cut two pieces from cardboard, these pieces would serve as the front and the back. Next I used the foam packaging materials as filler for the inside of the stones, sandwiching the foam between the two cardboard shapes. 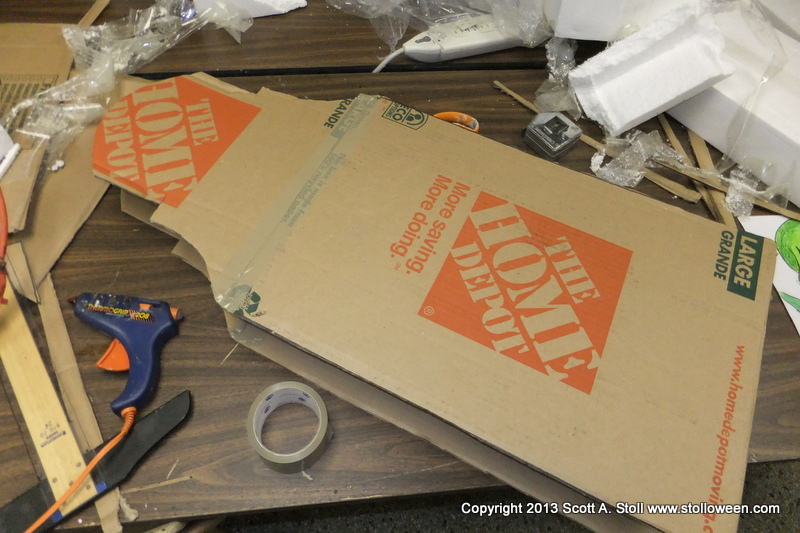 Hot glue was used to fasten the cardboard to the foam. 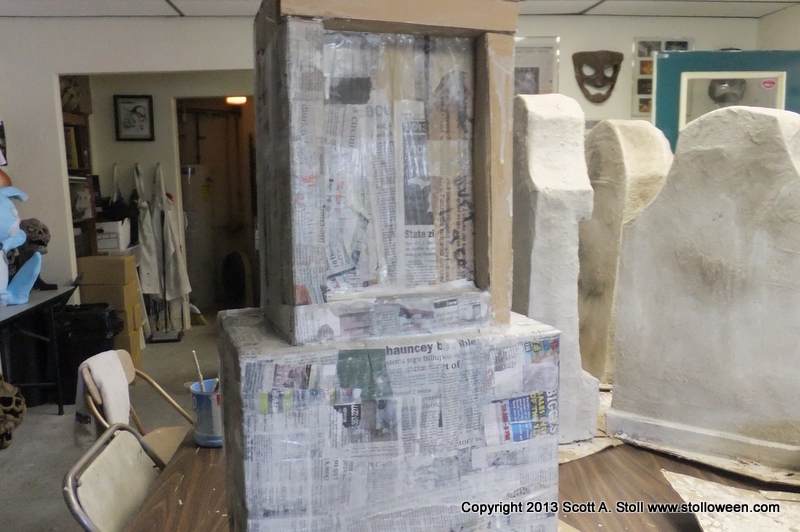 Packing tape was then used to form the sides of the stones; using tape allowed me to easily follow curved sections and was strong enough to support several layers of papier mache strips that would be added. 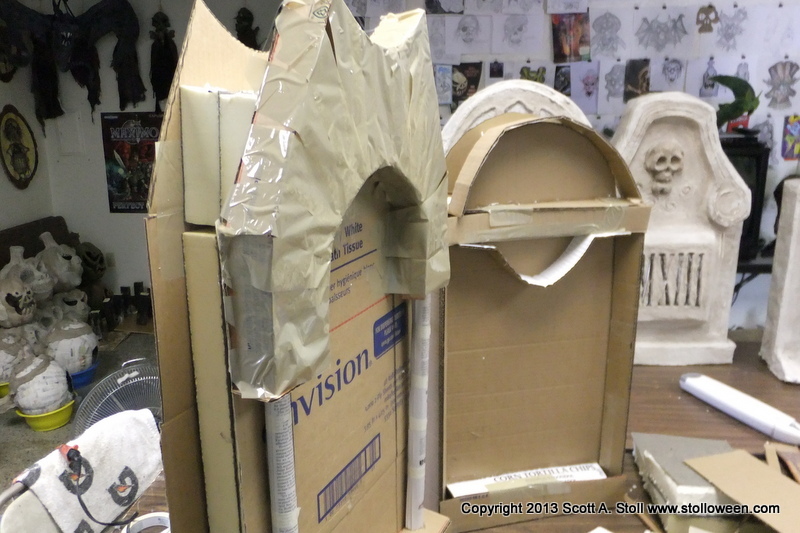 Additional details were added to the fronts of each stone using scrap pieces of cardboard. Once the basic shape was created it was surprisingly easy to create additional detailing and depth. 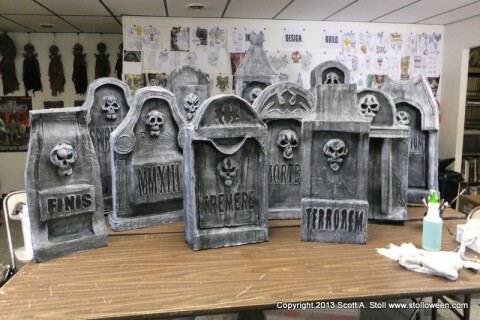 STEP TWO: Once the basic shape of each stone was created from the boxes the entire tombstone was covered with several layers of papier mache strips. 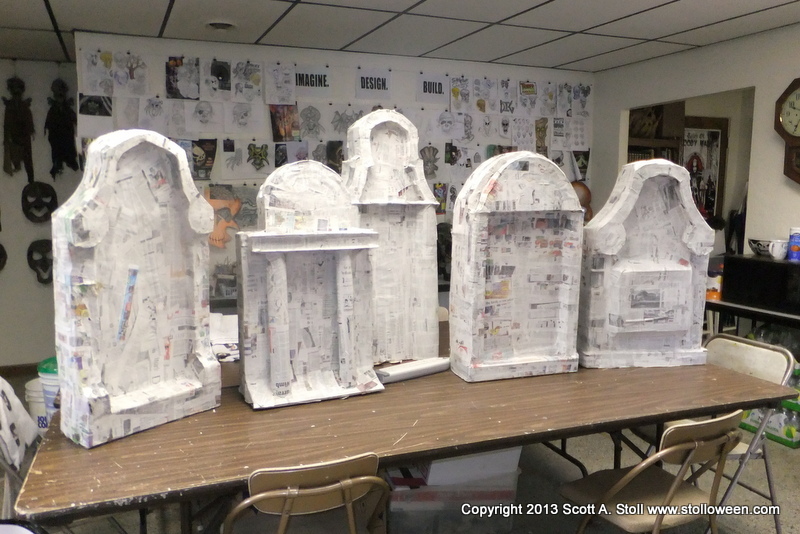 Strips of recycled newspaper were coated in a flour/glue/water paste and applied over all surfaces of the tombstone armature. STEP THREE: After the papier mache strips had dried thoroughly it was time to get creative and add the details that would turn the tombstones into convincing and interesting decorations. 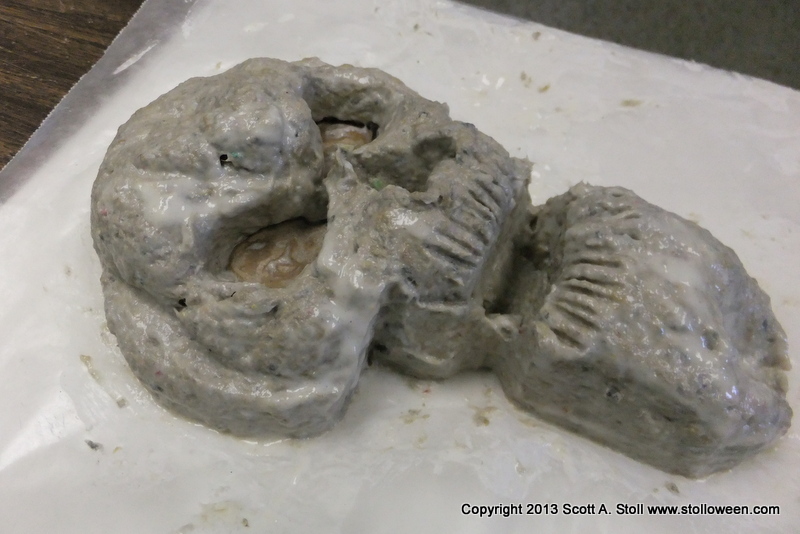 The Skull Adornments: Using my homemade paper clay I sculpted some little skulls that would adorn the top of each stone. 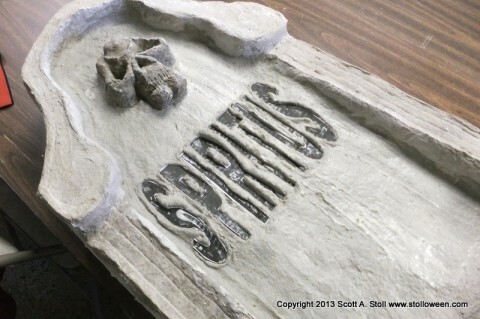 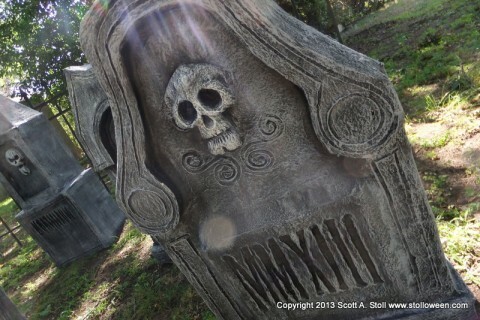 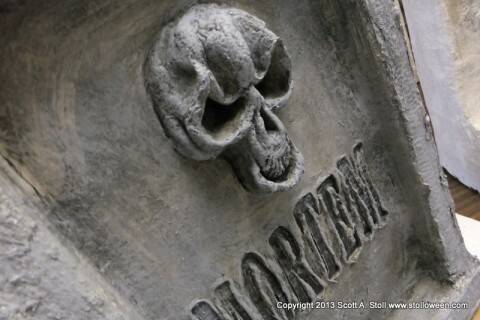 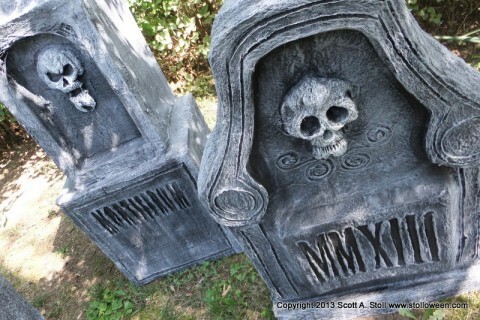 Each skull was a sculpted onto a sheet of wax paper, and allowed to dry before being added to the tombstone. The Lettering: Engraved lettering was achieved by printing out words and numbers from a computer then gluing the lettering to a sheet of recycled cardboard. 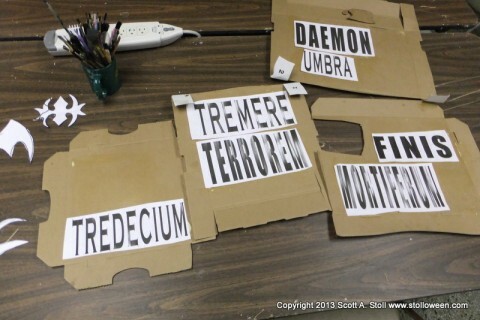 Each letter was then cut from the cardboard. A thin layer of paper clay was added to the face of each tombstone and the cardboard lettering was then pressed into the clay and left to dry. The same technique was also used to add ornate designs. 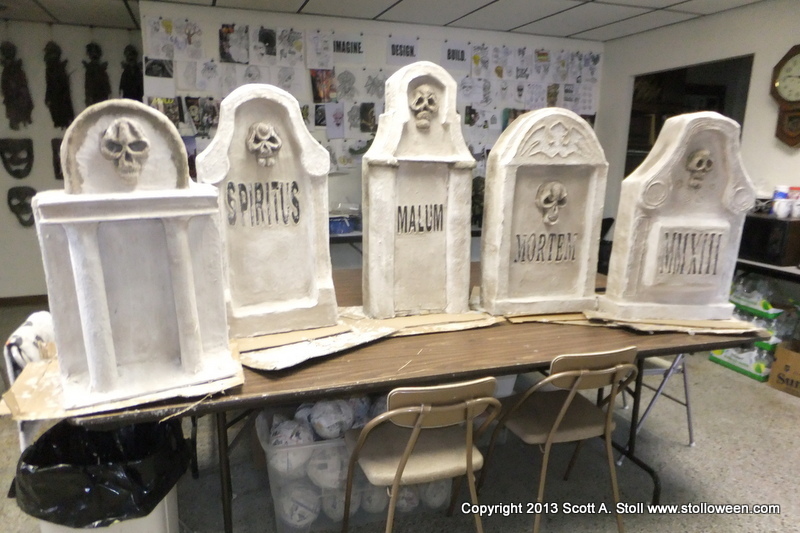 Extras: On some of the tombstones I added cobwebs in the corners by dipping small pieces of cheesecloth into the papier mache paste and applying it over the wet paper clay. 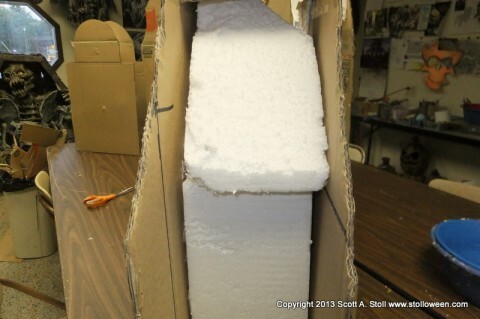 Additional detailing such as cracks and chips were formed into the clay. The tombstones were placed on their backs and the clay was allowed to dry. STEP FOUR: After the front of the tombstones were completed and allowed to dry I added a very thin layer of clay to the remaining back, sides and top. The dried clay has a natural roughness that resembles stone. STEP FIVE: After all the papier mache had dried thoroughly each tombstone was painted with flat black exterior paint then dry brushed with a white latex primer. The dry brushing highlighted the roughness in the clay and accentuated the detailing such as the lettering, adornments and cobwebs. Diluted black paint was then sprayed (using a spray bottle) along the top of the tombstones and allowed to drip down the front, the resulting effect helps to age and weather the stones. 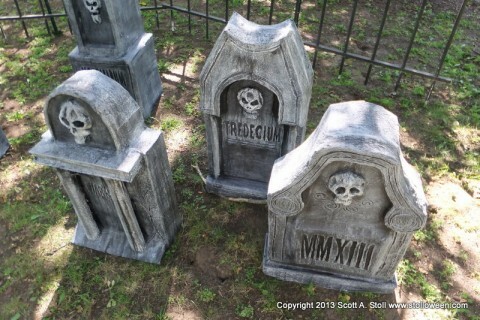 If the tombstones are to be used outdoors in conditions where they may get wet then need to be coated with a protective sealant such as spar urethane which is available at any home improvement store such as Home Depot. 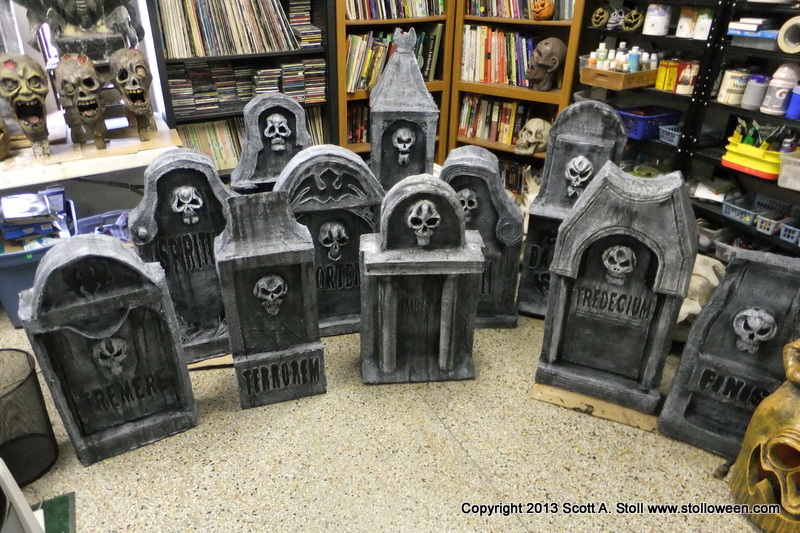 The final results are large, chunky, fully three dimensional tombstones that look good from any angle and add a good dose of creepiness to your Halloween display.